Travel into another world. Learn the local language as you go along. Hmm, you are right that the potions grow rather irrelevant a bit quickly, enough to warrant making a new potion for the second dungeon. That is a good point, actually. I will look into that. I have already dealt with some of the things you mention; In my working version, The encounter rate has been drastically reduced. I have made the first few fights a little bit easier. Also, the starting will be a lot easier now, as I have changed it so that you always start combat with full HP (unless KO'd). You are right that the dialogues are a little oddly shaped; I run all text through a separate translation function, in which I did not have the time to perfect before the due date for the IGMC. I am aware of the indent that happens as a result of that function, and I will be fixing it shortly. As for the names: I was split as to whether or not to use Yanfly's message core or not for displaying the names. I like my own way too, and left it like that because I didn'thave enough time for it. I will probably change to the Yanfly plugin way of doing it, simply because having the name displayed in the message leaves too little space for the message. As for revival items: I have intentionally left them out of the shops, because I want them to be rare, and valuable for that reason, and transitively to make KO more of a dangerous state. At the moment, there is only one revival item in the game. As for item descriptions: Actually, most things have descriptions. 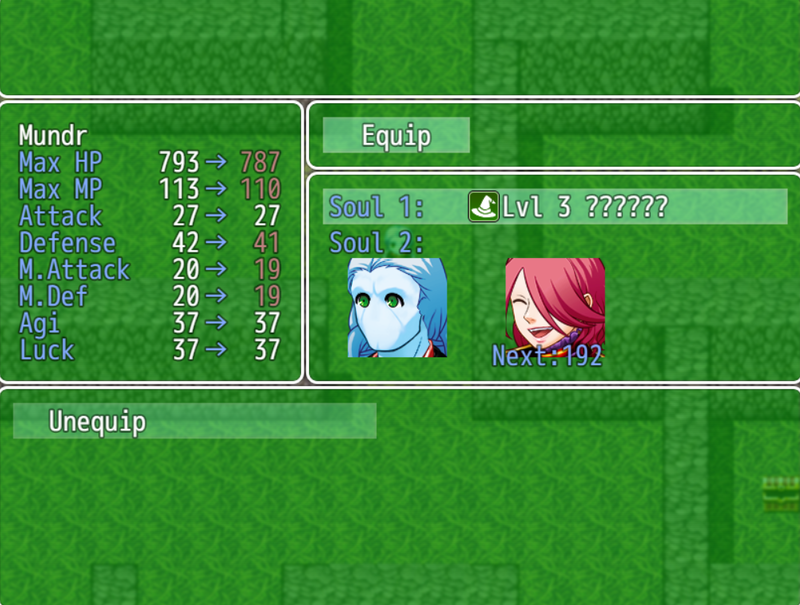 All equipment has, but not 3 of the 4 usable items. Considering there is only 1 of the last item, effectively you are right that most items lack descriptions. I have added descriptions to said items now. You are right that the mage is killed off a bit too quick. Her death has important meaning for the underlying story, and I wanted to squeeze it in. If not for the play time being supposed to be around 1 hour, I would have had that happen at a slightly later point. If you mean the music in Himinbjorg, the starting city in Aasgard, that is just called Theme3, from bitter sweet entertainment's Light Novel Standard Music. Also, thank you for going through the game. I will be fixing the bugs that I see happened in your playthrough. You are right that there are not enough NPCs. I simply did not have enough time to add more than there are before the release date. Most buildings are also left unenterable, and most enemies have a quite empty attack pattern for the exact same reason. I have already added more in the working version. That being said, considering that the map is as small as it currently is; I wouldn't agree that the number of NPCs are a big issue when it comes to the language in this game. After all, you can at any time refill your Mead of Poetry. It stands to reason that the language will be more pronounced the further you move away from the point where you fill up on the Mead, but the game is simply not long enough yet for that. That being said: there should be more NPCs than there are. But not because of the language, just because it would fill up the world more. Found, and fixed the error in the linux version. I can't upload the fix before the end of IGMC'18, though. Thank you. 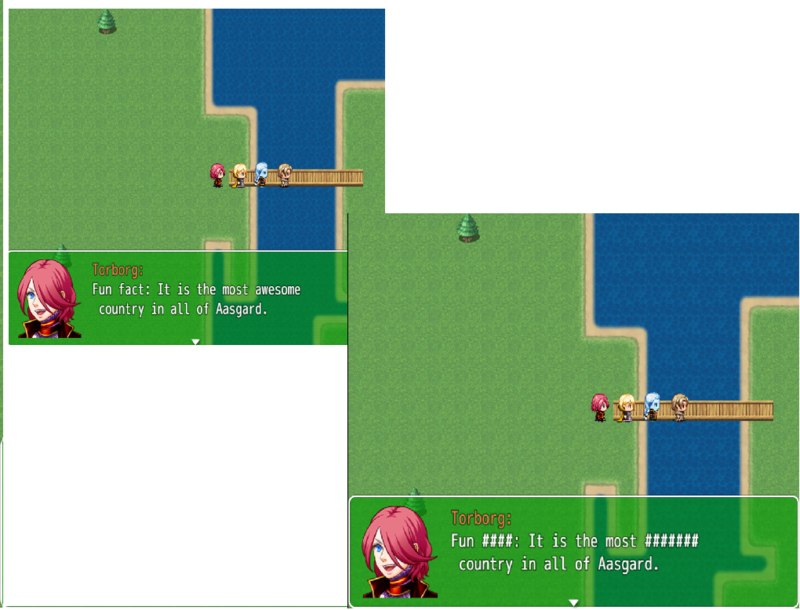 I ran quite short of time near the end, which is why the maps are a little bare, and enemies a little simple. I am already in the process of reworking them. 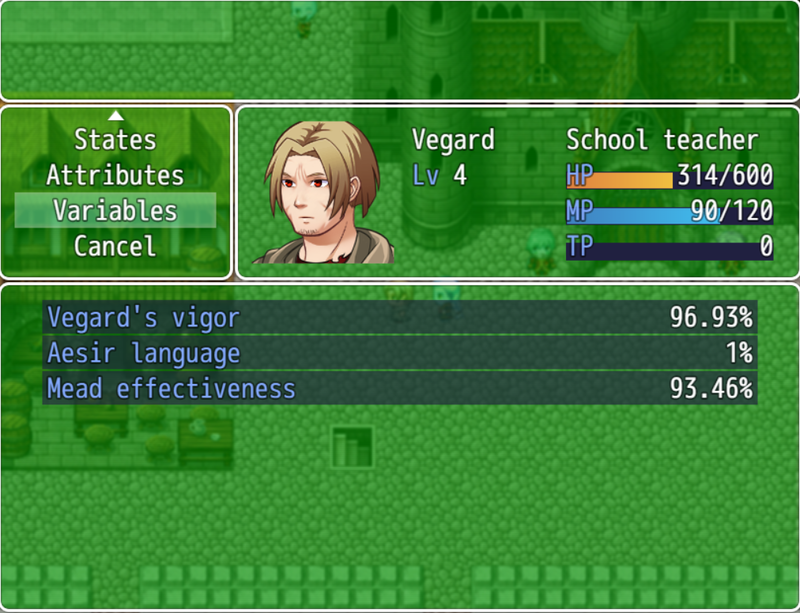 I will try to see if I can find a more reasonable encounter rate, and work it into the next update! You might want to make the input sequence thing around 10 times easier, or make it skippable. I can't even get past that after like 10 tries. Not to be a grammar-nazi, but cream in Japanese katakana is written クリーム. Without the ー it just looks strange. Note: Android version not complete, and does not contain .apk as of yet. Concept: Travel into another world, based on Norse Mythology. Learn the local language as you go along. 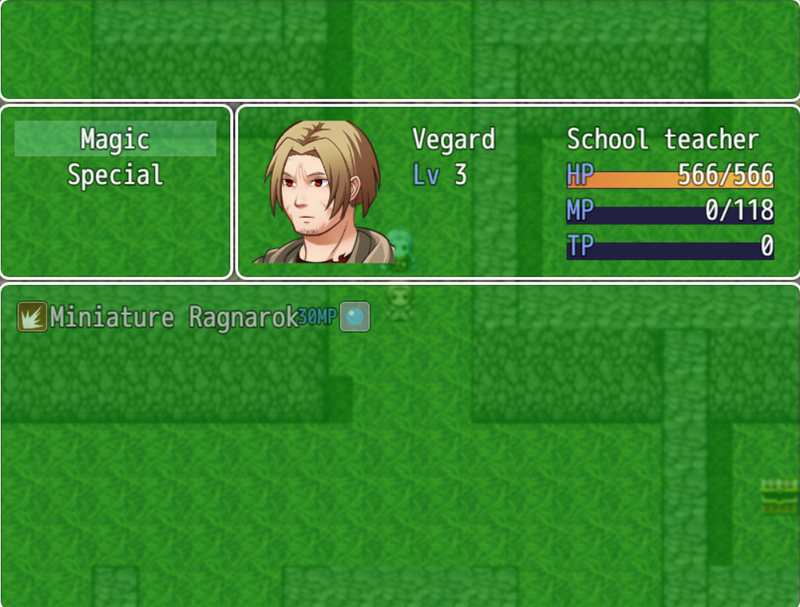 It is a jrpg in a setting of Norse mythology. 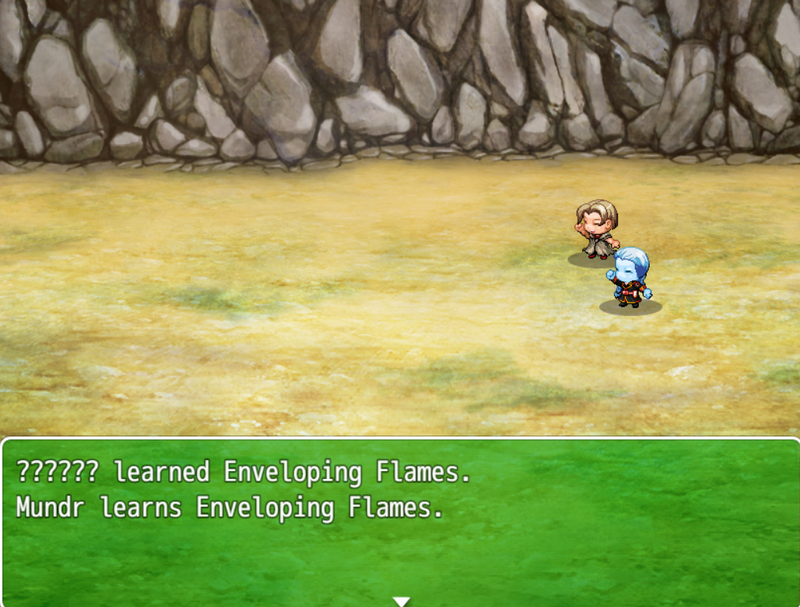 A big part of the game is learning the language of the world you travel to, which has implications both for understanding what people say but also for combat, as learning a characters language gives them a cooperative benefit. As I am the only one to have tried it so far, I am welcoming any feedback on the game (positive or negative)!